While Phil Hellmuth was busy putting even more space between himself and the chase-pack of Doyle Brunson and Johnny Chan (Hellmuth picked up his twelfth WSOP bracelet on Sunday night compared to Chan and Brunson’s 10 WSOP bracelets) the man many people consider has the best chance to overtake Phil one-day was gunning for WSOP bracelet #8, Phil Ivey. Ivey made the final table of the $10k Pot Limit Holdem tournament, facing-off against some very tough poker hombres including Andy Frankenberger who is one of the hottest poker players over the past couple of years, seasoned tournament veteran Hoyt Corkins, two online legends in Matt Marifioti and Shaun Deeb, and 2011 WSOPC Regional winner Ali Eslami. Corkins was the first big name to fall at the final table, followed by Daniel Weinman, and then the two online poker studs, Matt Marifioti and Shaun Deeb. The eliminations continued as two of the lesser-known players hit the rail in fifth and sixth place, leaving Eslami, Ivey, and Frankenberger to battle three-handed for the bracelet. Eslami was the next player to hit the rail after being crippled when he ran A/K into the Pocket Aces of Frankenberger, putting Ivey just a single elimination away from bracelet #8. Frankenberger and Ivey began heads-up play on equal footing but it was all Frankenberger throughout the match, and the Season IX WPT Player of the Year picked-up his second WSOP bracelet in as many years, while at the same timed denying Phil Ivey #8. Frankenberger is quickly becoming one of the most feared tournament players in the game, having racked up an impressive number of big wins over the past two years. 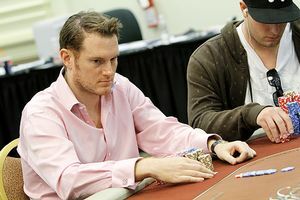 Frankenberger first came onto the live tournament scene in 2010, and by June 2010 he already had a six-figure score on his resume, winning a Venetian DeepStack event (the win being a sign of things to come). Since then Frankenberger has won a WPT title, finished 5th in two other WPT Championships, final tabled a WSOPC Regional Championship, won the Party Poker Premier League and captured two WSOP bracelets. Since 2010 Frankenberger has won three major tournament titles and pocketed over $2.5 million in earnings, not to mention being named the World Poker Tour Player of the Year. This entry was posted on Monday, June 11th, 2012 at 7:42 am and is filed under Poker News. You can follow any responses to this entry through the RSS 2.0 feed. You can leave a response, or trackback from your own site.